This month Chris Nickson writes about Leeds artist Jacob Kramer, a man with his soul on fire. 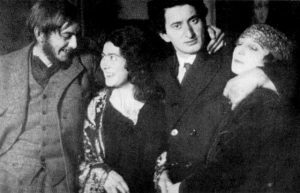 Roy & Mary Campbell (left), Jacob Kramer & Dolores (right). 1920s. Courtesy of Wikipedia. Go upstairs to the East Gallery in the newly-reopened Leeds Art Gallery and you’ll see several works by Jacob Kramer, focusing on his early work, exploring the ‘spiritual’ in art. His paintings stop you in your tracks. They’re mysterious, enigmatic, yet also transparent. Lights in the darkness. They seem to be by a man who sees through to another, deeper world. Leeds has produced several great artists, and Kramer was one of the greatest; indeed, for 25 years the Art College was named for him. But these days, sadly, he seems to be more of a footnote, rather than his name blazing in huge letters. Jacob Kramer was an immigrant. Born in the Ukraine in 1892, he was the son of a court painter and an opera singer. The family fled the Russian pogroms and arrived in Leeds in 1900, settling eventually in Chapeltown, and Jacob went to Darley Street School. Sometimes, anyway. Often he wasn’t there, or even at home. Kramer won a scholarship to Leeds College of Art and stayed for two years, although his restlessness frequently got the better of him. Eventually he studied at the Slade in London, although his first exhibition was held much closer to home, during 1915 in Bradford, before he was conscripted and served in the army from 1917-18. His heart remained in the north, in Leeds where he’d grown up, the city that helped to shape him. He made it his home, even as he produced the work that saw him hailed as one of the greats, he noted,“For myself, I find more stimulus in Leeds than in London and even in Paris”. He knew painters from many different circles, his fame grew, yet he always followed his own path, with his Jewishness as a constant inspiration. And in that, he found the depths of his soul and put them on the canvas. He was a member of the Leeds Fine Art Club and a founder of the Yorkshire Luncheon Club. Lauded, but far from rich, he taught at the Leeds School of Art, and painted many of the leading figures of his time – Gandhi, Delius, Priestley and more. A major exhibition of his work was held in Leeds in 1960, just two years before he died. As a sign of his influence and stature, in 1968 Leeds College of Art was renamed Jacob Kramer College – a title that stayed until 1993. Leeds has produced some of the great artists of this country. In Kramer, a man who preferred Leeds to London, who found a world here, we have one of the best of the 20th century. Visit his work at Leeds Art Gallery and the Stanley and Audrey Burton Gallery at Leeds University – see the paintings and understand a man with his soul on fire. Chris Nickson is the author of several historical crime novels set in Leeds. 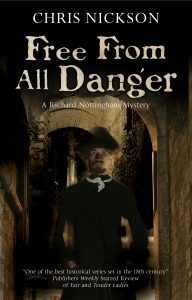 Free From All Danger is the long awaited eighth novel in the Richard Nottingham series. Leeds, 1736. Lured out of retirement to serve as Constable once again, Richard Nottingham discovers that he’s dealing with a new kind of criminal: someone who believes he’s beyond the law; someone willing to brutally destroy anyone who opposes him. To stop him, Nottingham must seek help from some very unlikely sources. Free From All Danger was published on 31 October by Severn House. You can order your copy here.